Okay, the charcoal class is driving me nuts, but I don’t think I am the only one who thinks that charcoal is some kind of medium of torture. I have noticed other students in my online class mentioning that they are having a tough time with the medium as well. I suppose misery loves company. But I think knowing that I am not the only person struggling makes it okay to be struggling. I don’t want my classmates to be miserable. I keep telling myself that this is not my medium of choice and not to be so uptight about it all. This is hard because I am naturally a person who likes things done right the first time and has the attitude of “why do something if one is going to do it half-assed?” I don’t see the point in that, and yes, I do know that as time goes on, that I am becoming part of a minority. Few people take pride in their work anymore….but that is entirely a blog topic on its own. So I was frustrated the other day while working on my homework that I made a post on facebook describing my sentiments. My facebook post: More homework. 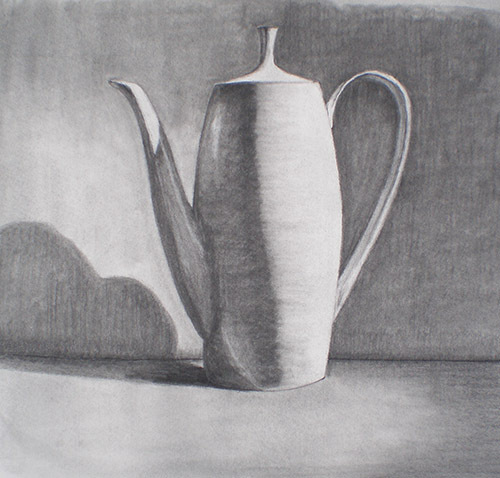 Ugh, charcoal is stressful. Charcoal is messful. Why must I work with this? It is damaging my bliss. Oh back to the days of acrylic paint where the sight of the medium didn’t make me faint. …….blah blah blah…..I need Farren to finish this. I am not a poet. So my friend Farren did indeed see my post and she kindly wrote this poem for me. And as you will read, she is a MUCH better poet than I.
could come from mighty oak? Just really makes me groan!! Who says that arts do not cross boundaries! She’s a poet and an artist. And deserves a bit more admiration than what she has been getting. She has also tried charcoal and found it to be a difficult medium to work with a well. So why do art schools around the world require the students to work with it? Well, it’s way to teach blending, value, composition, and chiaroscuro without using super expensive tools and materials. And there is another reason. Did you see my drawing posted above? It’s okay. It looks like what it is supposed to be, but there are people so talented that you would think that you were looking at a photograph. Go visit this website www.artrenewal.org, they have wonderful examples of incredible artwork. They can be a bit full of themselves, but the artwork is generally superb. The site changes frequently so just hunt around and I am sure you will something amazing done in charcoal. Also, while you are away from the blog, go check out Farren Robinson’s book of combat poetry that sounds like it was written during Great War of 1914 to 1918 but is so very timely for our modern day concerns. Farren’s book of poetry. PS – I did not put in the weird underlined advertising links. I can’t get rid of them, and I am NOT getting paid for them being there either. Not very happy about this. 😦 My apologies.